Rainfall was happening at the top of the state and at the bottom- and not so much anywhere in between- at least on Tuesday into Tuesday evening. 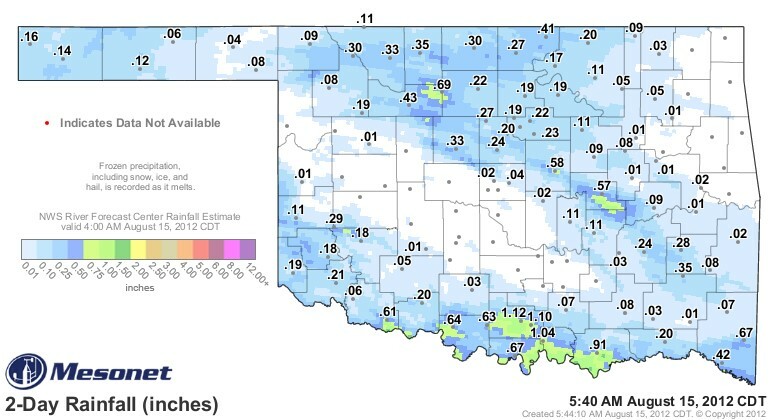 The rrainfall map shown above reflects the largest amounts of rain from the Tuesday batch of showers happened in south central Oklahoma along the Red river- Ardmore and a couple of other communities and the ranchland in that area receiving the benefit. Looking ahead to the next couple of days- Alan Crone with the News on 6 writes in his daily outlook this morning "We're moving back into the hot category today and tomorrow before another storm system drives a cold front into the state Thursday night into early Friday bringing a round of storms to the region followed by temps in the 80s. High temperatures today will be in the mid to upper 90s with readings nearing 100 tomorrow afternoon. The fire danger will remain elevated both today and tomorrow and state wide burn bans remain in place. "A warm front will scoot across the region this morning and should be positioned northeast of the state this afternoon. This will bring the warm conditions back to the region along with south winds in the 10 to 20 mph range. A few isolated storms may be possible later today with a few showers possible this morning across eastern or southeastern OK. The NSSL and RAP indicate a few isolated storms forming in central OK this afternoon during the 4pm to 6pm time frame. If they do form, they could be severe." (Click here for Alan's full look at the next day or so weather wise from his northeast Oklahoma perspective in Tulsa. Meanwhile, the National Weather Service says in their latest forecast discussion for central and western Oklahoma that "The best opportunity for scattered to widespread showers/storms still appears to be Thursday into Friday as the cold front moves across the region. A shortwave moving across the central plains will also provide some lift for rain. Some strong to severe storms will be possible through the end of the week. With NW flow aloft and some disturbances moving through the flow- Showers and thunderstorms will remain possible across portions of the area over the weekend. Temperatures will also be cooler with highs in the 80s for many locations over several days.